Mosquito magnet? Don’t like bites? Do what’s right! Protect the whole family with a naturally formulated, no DEET insect repellant. 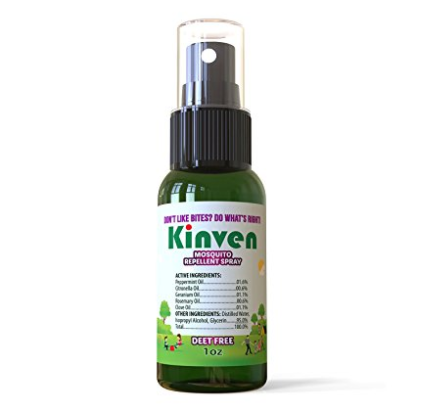 Get the Original Kinven Anti-Mosquito Spray! No need to spend on bug zappers, repellent traps, or insect repellent wipes. It contains a chemical-free formula that is safe for children and pregnant women. You just shake and spray and VOILA! BYE BYE Insect bites! INDOOR & OUTDOOR PROTECTION FOR THE WHOLE FAMILY – It keeps mosquitoes and bugs away from kids and adults. It’s a reliable DEET-free companion that safely fights killer insects at home, in the backyard or garden, or at camp without harming the skin. REPEL POWER THAT LASTS UP TO 4HRS – The concentrated yet safe protection lasts long. It works on your skin, clothing, and personal belongings. It’s a must-have travel essential when going on an island holiday, a hiking trip, or a fishing vacation. MADE FROM ORGANIC ESSENCES – Active ingredients are oils of peppermint, citronella, geranium, rosemary, clove. Water, isopropyl alcohol, & glycerin are added for better effectiveness. Despite being scented, it produces no unpleasant odor. RECHARGES EFFECTIVENESS OF KINVEN BRAIDED BRACELETS – Still have your Braided Bracelets? Allow them to continue serving their stylish wristband purpose by recharging them with the Kinven Mosquito Repellent Spray! Just spray and wear! LIGHT & EASY TO CARRY – It comes in 3 convenient bottles – 1ounce, 2ounces, and 4ounces. It fits in your bag, pouch, and even pocket! Make it a part of your backpacker necessities, and you’ll surely have a peaceful sleep wherever.